The time has come for Jack to once again attempt to climb the beanstalk. It’s not that Jack hasn’t tried before. But such an opportunity has been very rare, with only two prior attempts in fifty-two years, both of which were unsuccessful. The first time, back in January of 1981, most expected that Jack would be victorious. But as we all know, the favorite does not always succeed, and Jack was wound up tighter than a yo-yo, nervous and on edge, and it showed as he never had a chance, hitting the ground with a thump almost before he started the climb. During his last attempt in 2005, Jack showed more resolve early on, and for a while, it looked like he might actually succeed. But the giant not only had too much talent, but also seemed to use some unscrupulous methods against Jack, and with time eventually working against him, Jack did not display the urgency that many expected, which eventually resulted in his downfall and another lost opportunity. And so it’s come to this. Thirteen years have passed, and on Sunday, Jack will once again look up at the beanstalk and attempt to do what has failed him those two previous occasions – climb to the top and rightfully claim all the riches that await there. Many will wait with bated breath as he tries, knowing that the giant that awaits to thwart him is not only a very formidable foe, but the same one he faced previously. The giant has seen many attempt to try, and with the exception of one, all others have failed. Shall he succeed, there will be more than just a bag of gold coins, a goose that lays golden eggs, and a magic harp awaiting him. If he succeeds, the heart and admiration of a city, a city that has watched him come so close before only to fall short, will be in his hands. If he succeeds, all the demons of years’ past will have be exonerated. All of those years when others around him were successful multiple times while Jack could not succeed even once will have been forgotten. The “Jack”, as you know by now, is your Philadelphia Eagles, an organization that has not tasted a championship since 1960. Ironically, the “Super Ball”, a bouncing ball made of synthetic rubber, was created four years later, which was the basis for the coining of the NFL championship being called the Super Bowl. But 52 years of the modern age of the NFL (the “Super Bowl” age) have passed, and while the other kids that play alongside the Eagles in the NFC East playpen (the Giants, Redskins, & Cowboys) have won 12 of the previous 52 Super Bowls, the Eagles still carry the shame of never having won even once, figuratively wearing a big fat zero on their chest like a scarlet letter. But all that could change come Sunday night. Much like the Patriots did back in the 2001 season, a win, in the best case scenario, could catapult this team into years of organizational success with Carson Wentz at the helm. Win, and the Eagles have some bragging rights with their fellow NFL, and more specifically, NFC East brethen. Once again, their opponent is the favorite, but would they want it any other way? The prognosticators haven’t had the Birds favored in three straight games, but prognosticators are like meteorologists…they only seem to be right half of the time anyway. The one area where the Eagles lack compared to their opponent is experience, but eventually, blocking, tackling, schemes, and talent win the game, and the Eagles have enough of it to succeed. The strange thing is that while New England has won 5 of the last 16 Super Bowls, they’ve all been close games, with their five victories decided by a total margin of 19 points. They’ve never dominated their opponents the way the San Francisco 49ers of the 1980’s and the Dallas Cowboys of the 1990’s did. At some point, the clock did EVENTUALLY strike midnight for Cinderella. Perhaps it’s now time for the Patriots championship carriage to turn into a pumpkin as well? I think the Eagles will win for one reason and one reason only – it’s THEIR time. This team has faced so much adversity in the form of injuries to key players, with the biggest one being the loss of their franchise quarterback. Yet they have persevered and made it all the way to the doorstep of a championship. If the Birds don’t attain their ultimate goal on Sunday night, we can look back at a very enjoyable season with much optimism for the future. But if they were to win, aside from celebrating in frigid Minneapolis on Sunday night, I will ecstatically look forward to one thing – writing about it afterwards. The writing part won’t be hard at all. Frankly, it’s been in my head for 12 years since I started writing about the Eagles to my friends by email on the eve of the NFC Championship in 2005. I just need the Birds to do their part and give me a reason to put it on paper….and I believe they will. So fasten your seatbelts and, as an ex-Eagles wide receiver once said “Get your popcorn ready”! Jack is primed to climb the beanstalk once again, and this time he is meant to succeed. We’ve once again reached the pinnacle of North American sporting events, the Super Bowl. And once again, those of us in the Delaware Valley will not have a strong rooting interest due to our beloved Birds being excluded from the party for the 49th time in 51 years. So the next question becomes, whom to root for? The Patriots are not well liked in these parts, which is rare for a team which we only face once every four years. But add in stolen signals, deflated balls, and the fact that Bill Belichick looks like Emperor Palpatine from the Star Wars movies, and one can understand why. But while we hold a certain disdain for the Patriots, their opponents, the Atlanta Falcons, do not endear a “warm and fuzzy” feeling either. They’ve only made the Super Bowl once (and lost) which could cause many to give them the sympathy vote, but their fan base doesn’t seem to be starved for a winner, as the city of Atlanta seems to be more about college football than following any of their four major sports teams. The one thing that could swing the likability factor in favor of the Falcons is their quarterback, Matt Ryan. Ryan is a local kid who played at Penn Charter High School and went from Boston College to the big time of the NFL as the 3rd overall pick in the 2008 NFL draft. While Patriots quarterback Tom Brady always seems to be in the news for various reasons, (four-game suspension he served earlier in the year, his supermodel wife, Gisele Bundchen, etc. ), Ryan has become a bonafide NFL starter who seems to be grounded with a solid work ethic. He seems like a guy you want to root for. As for the game itself, I’d like nothing more than to see a competitive game first and foremost. Eight of the ten playoff games this season were thoroughly one-sided, something which does not bode well for the NFL, whose ratings were hurting in the regular season to began with. A closely played Super Bowl would help to remind fans just what it is that they enjoy about this sport so much. New England comes in with a ton of Super Bowl experience, while Atlanta comes in with none. The Falcons are a very young team and the first five minutes of the game will say a lot about the direction this contest goes. If Atlanta allows the pomp and circumstance of the pregame to get to their psyche, this game could be over long before Lady Gaga begins her halftime performance. But if the Falcons can remain composed and don’t turn the ball over early (and better yet, manage to score on their first drive), they will be in it for a full 60 minutes and have the firepower offensively to outscore the Patriots. Falcons do just that, and win 31-24. And NFL Commissioner Roger Goodell is spared from having to present Tom Brady, whom he suspended for four games this season, with the Super Bowl trophy. There have been fifty Super Bowls played, and in only five of them (10%) has there been a lead change in the last two minutes of the game. There has never been a Super Bowl that has gone into Overtime. We’ve been lucky for the last six years. Along with the usual pomp and circumstance of a Superbowl party, consisting of wings, beer, pizza, nacho dip, crab dip, etc. (all of which can sometimes lead to certain individuals taking part in another “dip” that starts with “skinny”), we’ve been lucky to have an entertaining Superbowl which has gone down to the wire for the last six consecutive years. Starting in 2008 when the Giants shocked the then 18-0 Patriots, and going all the way to last year, when the Ravens defeated the Niners in the “Power Outage” bowl (which should have been sponsored by the Energizer bunny), the 2nd-half suspense of the big game consisted of more than just looking at one’s Superbowl block pool to see if any money was coming your way. But that all changed this year. This year’s Superbowl was a flashback to the majority of the games that took place in the 1980’s, when the AFC Champion would claw its way to the top of its conference, only to become easy fodder for the 49ers, Redskins, or Giants, the big three who ruled the NFC back then. The “big game” was big only in name and hype then, and never quite lived up to its billing once the action on the field actually commenced. Fast forward to this year’s game, where the Broncos played as if they were on a drinking binge for the last two weeks and woke up with a major hangover just moments before the national anthem played. The Seahawks, meanwhile, were sharp and played with a purpose, and being one of the youngest Superbowl winners ever, they will probably be near the top of the mountain for years to come. Seattle went from 7-9 just two years back to Superbowl champion due to drafting well the last few years, including in the later rounds, a strategy that other teams would do well to emulate. Of course, everyone has the desire to draft well, but having the right people in place to do so is another story. The Eagles were 4-12 in 2012 mostly due to awful drafts in 2010 & 2011. But surprisingly good drafts the last two seasons helped them rebound to a 10-6 record in 2013, and another year or two of solid drafts will be needed if the Birds hope to win the first Superbowl in the team’s history. As for the Superbowl “extras”, my favorite commercial was the Audi “Doberhuahua”, featuring a hybrid dog which was part doberman and part chihuahua. Aside from the dog’s humorous antics, the “huahua” part somehow got me hungry for a Wawa hoagie…even though it was acting more like a “hotdog”. Coming in 2nd was the Geico gecko “cheesesteak shuffle”, if only for the fact that it centered around Philadelphia. In the commercial, the Geico gecko is doing his own cheesesteak shuffle to celebrate the fact that a cheesesteak is available just as readily as Geico insurance. While I would still take the “Ickey Shuffle” (courtesy of former Bengals running back Ickey Woods) over the cheesesteak shuffle, my question is – since the gecko is doing the dance across from Geno’s, does that mean that he’s really a Pat’s Steaks fan?? These are the questions that go through my mind during a one-sided Superbowl. That, along with my commentary that the 2013 Eagles would have given the Seahawks a much better game than the Broncos did (even though, technically, the Birds can never play the Seahawks in the Superbowl being that they’re both in the same conference). The Last Word: The end of another football season is upon us, and with it, the winter of our discontent has begun. Sundays in February leave a void that is not filled for me until April, when the Phillies start their season and a possible Flyers playoff run may commence. Add to that, a colder and snowier winter than usual and April cannot come fast enough (I know there is March madness, but last time I watched, and was interested in, college basketball was during the Clinton Administration). The end of football season also usually coincides with me going into writing hibernation and not coming out of my hole till Eagles preseason has begun. 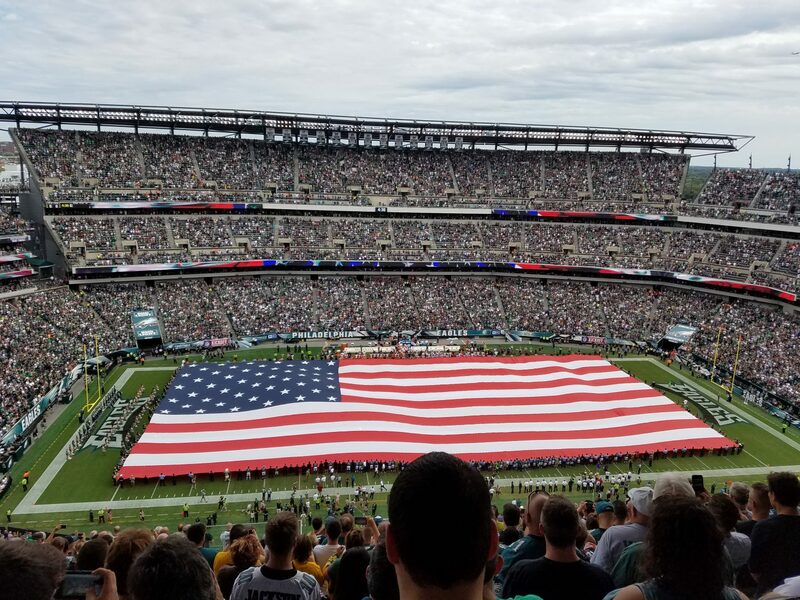 However, this year, I do plan to write at least once a month about the various goings on in the Philadelphia sports scene, as Broad & Pattison is still occupied even when the Eagles are not one of the inhabitants. Until then, stay warm everyone…pitchers and catchers report in just under two weeks. Broncos vs Seahawks 6:30 PM (FOX) – For this one, they should bring back the Kingdome and Mile High Stadium. Bring back Dave Krieg, Jim Zorn and Steve Largent. Bring John Elway out of the executive box and Tom Jackson out of the ESPN booth. While the Seattle Seahawks played in the NFC west in their inaugural season of 1976 (and reside there now), they were actually in the AFC West from 1977 till the start of the 2002 season, where they faced the Broncos twice on an annual basis as division foes. Ironically, their first ever playoff appearance came at home against the Broncos in the 1983 AFC wildcard game when, leading by 10-7 at halftime, the Seahawks exploded for 21 unanswered points, leading to the franchise’s first playoff victory. Did I know that info. by researching the internet? No…I actually remember watching that game in my parents’ family room as a little tyke growing up in Northeast Philadelphia (while I frequently struggled just to get a C grade in elementary school due to lack of interest, I can recite where I was watching random NFL games from childhood with relative ease….go figure). With all of the history then, this is, in essence, a “Back to the Future” sort of Superbowl. And while Peyton Manning would do an admirable job of playing “Biff” the bully, it would be his brother Eli, instead of Seattle QB Russell Wilson, that would be a better fit to play the role of “Marty McFly”. While the main focus in the NFL usually centers on the quarterbacks, the conference championship games showed us that football is still a team sport, and losing one piece of the puzzle on your team can lead to devastating consequences. In the AFC Championship game, New England seemed to keep Peyton Manning in check until Patriots cornerback Aqib Talib went out with a knee injury. After that, it was as if the border patrol went out to lunch and never returned, as Broncos receiver Demaryius Thomas suddenly began to get open against a mismatched secondary, ending with seven receptions for 134 yards. In the NFC title game, even with all the talk of Russell Wilson & Colin Kaepernick, it was Seahawks cornerback Richard Sherman that made the defining play, followed by a defining rant that has gotten more played out than those annoying Progressive Insurance commercials with “Flo” (personally, I prefer “Jan” from the Toyota commercials). So who wins this Sunday? Peyton Manning was lucky to play in 63-degree weather at home in the AFC Championship, but it will most likely be much colder than that come kickoff Sunday night. The Seahawks are used to playing in dreary weather in the Pacific Northwest so the conditions should suit them just fine. The matchup pitting Broncos receiver Demaryius Thomas against Seahawks cornerback Richard Sherman will be the most intriguing one to watch. Unless the Broncos get lucky again by way of the opposing cornerback going out with an injury, think the Seahawks will take this one and win their first ever Superbowl. The Last Word: Superbowl XLVIII will be the first in 19 years featuring two teams that reside west of the Mississippi River, and the first in 14 years that will not have a participant from the Eastern Time Zone. After a thrilling 1st round playoff weekend where three of the four games were still in doubt going into the final two minutes, the Divisional playoff round seemed to leave a lot to be desired. Actually, it was, to paraphrase a 16-year old girl, “Like…BORING!”. The Saints and Seahawks contest, which many thought could be a blowout, actually ended up being one of the more competitive games, with the Saints having a chance to at least throw a hail mary into the end zone on the last play of the game to possibly tie it. That is, until Saints receiver Marques Colston had a brain freeze, lost track of time, or just decided to play hot potato with the football, resulting in a New Orleans penalty and the end of the game. The Saturday nightcap between the Colts and the Patriots looked to be one which could go down to the end and go either way, but the Patriots had the game well in hand relatively early in the 4th quarter. Luckily, due to the exciting life I lead, yours truly was already snoozing on his couch by then. Sunday brought us the Niners and the Panthers in what was billed as an intriguing defensive matchup, but Carolina was done in on three drives: Two 1st half drives in which they scored a total of only 3 points while having 1st and goal both times, and a 3rd quarter, 8-minute plus drive that yielded a big fat zero on the scoreboard. The Niners took over the game in the 2nd half and never looked back, as they now head to the NFC Championship game for the 3rd consecutive year. The Broncos and the Chargers finished up the Sunday playoff brackets, and for the 1st three quarters it looked like San Diego was ‘California dreamin’ as they looked fast asleep and lifeless in falling behind 17-0 after three quarters. The Chargers also seemed to think that the word “Omaha” was a new synonym for “hike”, as they had a number of offside penalties caused by Peyton Manning’s signal calling (do Broncos fans play a drinking game where one drinks every time Manning says Omaha?). So we are now down to the final four, and the teams that are still alive are who we thought they would be (to paraphrase former Vikings and Cardinals coach Dennis Green). Patriots at Broncos 3:00 PM CBS – For the 15th time, future hall-of-famers Peyton Manning and Tom Brady will face off, and while it is the Broncos vs. the Patriots, there is no denying that Brady is Manning’s “daddy”, having won 10 of their 14 meetings. While Peyton’s passing numbers are historically astronomical, the playoffs for Manning are like falling asleep in one of those old Freddy Krueger “Nightmare on Elm Street” movies – a nightmare. He has a 10-11 career playoff record, and generally doesn’t play well in cold weather either. The plus side for Peyton? Sunday will be a balmy 60 degrees in Denver and the one time he beat Brady in the playoffs was playing at home for the Colts. On the New England side, Bill Belichick continues to make weekly trips into his mad scientist laboratory to conjure up ways to win, and Tom Brady might as well be throwing to a CPA, an electrician, and a hot-dog vendor with all the injuries the Patriots have accumulated. The Pats, like the Niners, will also be playing in their 3rd straight conference championship game, and I give Belichick and Brady a lot of credit for keeping the Foxboro machine going all these years (with the caveat that they haven’t won a Superbowl since Spygate was uncovered). I’m not bitter or anything…really. Niners at Seahawks 6:30 PM CBS – These two teams match up so well that if this game was played on a neutral field, it could possibly go to double overtime (in which case, I vote that it be decided by Seahawks coach Pete Carroll and Niners coach Jim Harbaugh duking it out at midfield). These two teams really do hate each other and for the last two seasons, the victor has been the one playing at home. But while that does not bode well for San Francisco, trends are meant to be broken (for reference, see the Bengals losing at home in the wildcard round and the Saints winning outdoors in the cold against the Eagles). Seattle didn’t play particularly well against New Orleans last week but managed to hold on for the win. A similar game against San Francisco and the Seahawks will find themselves eating pizza and wings at home during the Super Bowl instead of actually playing in it. The Last Word – Now that Chris Wheeler is no longer on the Phillies broadcast, I vote for the term “no doubles defense” to be banned from the broadcast as well. On a serious note, with the removal of “Wheels”, the last link from the original 4-man Phillies broadcast team that many of us in the Delaware Valley grew up watching/listening to are either off the air or are no longer with us (Harry Kalas, Richie Ashburn, Andy Musser, and Wheeler). Ladies and gentlemen, please welcome, your 1ST PLACE, PHILADELPHIA EAGLES! Yeah, I know…it sounds better than it actually is. If this was the NFC West, a 2-3 record gets you seated in the back of the classroom and facing the wall with a “dunce” cap on. In the NFC East, a 2-3 record means you’re the valedictorian of the class. But for years, the NFC representative in the Super Bowl came from our division, and a 10-6 record didn’t even guarantee you a playoff berth. So if we are the “NFC Least” for a few years, so be it. Last Sunday’s game, a barnburner featuring two teams with a combined 1-7 record going in, didn’t seem like much of a contest on paper, but by the end of it, there was enough intrigue to go around, especially when it came to the Birds and their quarterback situation. Most of the Eagles’ offense in the first half was predicated by the running of LeSean McCoy and Michael Vick, while the passing game was as ineffective as a drive from Center City to Manayunk on the Schuylkill in rush hour traffic. But when Michael Vick’s hamstring injury forced Nick Foles to come in cold off the bench, the passing game seemed to come to life, even though Foles running ability might be on par with a hermit crab race on the Ocean City boardwalk. Foles doesn’t have the natural athletic ability of Michael Vick (very few do), but he has a strong, and more importantly, accurate arm, and gets rid of the football quickly, while Vick seems to hold on just a tad bit too long. Foles will likely get the start this week against Tampa, which is a team in chaos and ready to implode any minute. Bucs head coach Greg Schiano is most likely near the end of his coaching tenure, as his “RA-RA” attitude may have worked when dealing with wide-eyed college kids at Rutgers, but won’t work with grown men who are professional athletes and getting paid handsomely to play football. But while Tampa may be winless on the season, they still have a very good defense, especially with Darrelle Revis anchoring one of the corner spots, and this game will be a good test for the young Foles to see if he is capable of facing more dominating defenses in the league with some level of success. Birds win this game but it’s a close one (23-17) due to taking the Bucs too lightly, and fans look forward to the following week and a showdown at home with the hated Cowboys for 1st place in the NFC Least. Packers at Ravens 1:00 PM FOX – One of four intriguing intra-conference marquee matchups on this week’s docket. Lions at Browns 1:00 PM FOX – You are not hallucinating….the Browns ARE one of the marquee matchups this week. J.M. (a reader from Cleveland) will be thrilled. Titans at Seahawks 4:05 PM CBS – The Titans are on the way up with head coach Mike Munchak at the helm, but this game, being played in the Pacific Northwest, is definitely a loss. Saints at Patriots 4:25 PM FOX – Brees vs. Brady…what more can a football fan ask for?? The Last Word – Last year at this time, the “grizzly veteran coach” award as the longest tenured coach in Philadelphia went to Andy Reid, who was in the middle of his 14th season with the Eagles. With the firing this week of Flyers head coach Peter Laviolette, that award now goes to current Eagles head coach Chip Kelly, who has completed (drumroll please) a whole ONE-QUARTER OF ONE YEAR with the Eagles. The Honeymoon is Officially Over…. Chip Kelly and the Eagles fans were on a week-long getaway to a remote resort island which included sun and fun, a plethora of activities, dinner and dancing in the evening, and romance at night. Then, after returning home, Chip forgot to clean the dirty dishes left in the kitchen sink overnight, and chaos ensued. Talk of a long and joyful union turned to frustration on a sun-soaked Sunday afternoon, as the Birds lost in the closing seconds, 33-30. While the offense ran up and down the field, scoring on six drives, their three field goals that couldn’t be converted to touchdowns eventually sealed their fate due to a porous defense that couldn’t stop the Chargers for most of the day. In Week #1, the Redskins began to mount a comeback but eventually ran out of time. The Chargers, showing no signs of rust, ran roughshot up and down the field from the 1st quarter, as if there were only plastic tackle dummies standing in the secondary. The good news is that the Eagles won’t have to let this loss linger in their minds for long, as the Chiefs come into town for a Thursday night affair. The bad news is that there might not be enough time to figure out exactly what went wrong. Not only will Thursday’s game feature the return of former coach Andy Reid, but also a ceremony to retire former quarterback Donovan McNabb’s number, which will no doubt add some intrigue to Reid’s return. When Terrell Owens returned to Philadelphia as a member of the Dallas Cowboys, the slogan was “Get your popcorn ready”. So perhaps this week’s slogan should be “Get your cheeseburgers ready”? When Andy Reid was the head coach in Philadelphia, he never hid his affinity for an all beef patty on a bun, invoking memories of Wimpy from the Popeye cartoon. And while the Birds had a great run for most of their fourteen years with Reid at the helm, whenever it came to the NFC championship, it seemed that the opponent was eating Popeye’s spinach to bypass the Eagles on the way to the Super Bowl. And while Donovan was one of the greatest quarterbacks in Eagles history, perhaps it was the “special sauce, lettuce, cheese” that caused him to get sick during the two-minute drive in the Super Bowl, which seemed more like a five-hour drive to Boston in rush hour traffic. Either way, those two will forever be joined at the hip, as Reid drafted McNabb and both enjoyed success together during their early years in Philadelphia. As for the game itself, the Chiefs come in at 2-0 and are much improved from their 2-14 season of a year ago. The Eagles have an offense that is capable of winning the Super Bowl, but a defense that is capable of going 0-16. With only four days to prepare, the Birds will score a lot of points but will fall short, losing 37-34 to “Big Red”. Andy Reid heads back to KC with his team at 3-0 and celebrates by enjoying some Kansas City barbecue. Packers at Bengals 1:00 PM FOX – The Cheeseheads invade the Queen City in a intra-conference matchup. Texans at Ravens 1:00 PM CBS – The Ravens probably won’t repeat as Super Bowl champions, but at least the number of statements made by a Ravens player that make absolutely no sense will decrease significantly now that Ray Lewis has retired. Falcons at Dolphins 4:05 PM FOX – Buckhead vs South Beach. Miami is usually a favorite hotspot for fans of the road team, but not sure if that applies to Atlanta, where Georgia Tech and any SEC team is more popular than the Falcons. Colts at Niners 4:25 PM CBS – The coach of the 49ers plays against the team that he almost guided to the Super Bowl as a quarterback. The Last Word: Chris Berman of ESPN, who seems to have a “man crush” on Andy Reid, went out of his way last Sunday to mention that Chip Kelly should thank Reid for all of the playmakers he has on offense. Berman conveniently forgot to mention that Kelly has no playmakers on defense due to a series of bad drafts when Reid was the coach of the Eagles.